Carpal Tunnel Syndrome is also recognized as median nerve compression. It is a condition, which gives rise to pain, burning, numbness, weakness and tingling in hand as well as the arm. As far as it causes are concerned, it occurs when the median nerve, which runs from the forearm into the palm, gets pressed or squeezed at the wrist. In other words, Carpal Tunnel Syndrome happens when the pressure of the median nerve at the wrist increases. When finding the causes of Carpal Tunnel Syndrome in detail, we conclude that this condition can be quite debilitating and difficult to deal with. Carpal Tunnel Syndrome occurs because of repetitive tasks, forces, postures, and vibrations at the workplace, and early detection and treatment with chiropractic care offers the best possible outcomes. How chiropractic therapies work best for Carpal Tunnel Syndrome? Most of the people turn to their chiropractors to get rid of the pain of wrist pain. The reason many CTS patients do not want to try any other treatment form is that chiropractic care helps in effectively managing the pain. Chiropractors aim to manage CTS pain without the need for medication or surgery. To seek relief from irritation and pain in the wrist in the arm as well as the neck, chiropractors follow therapeutic approaches from the spinal adjustment to trigger point therapy, as well as Therapeutic Ultrasound and Electrical Muscle Stimulation treatments. This natural and holistic approach to treating carpal tunnel syndrome is what makes chiropractic therapies the perfect way to manage CTS. Why Should You Rely On Dr. Allen Conrad For Carpal Tunnel Syndrome and Chiropractic Care? A leading name in the field, Dr. Allen Conrad is the best Carpal Tunnel Syndrome chiropractor in North Wales and Lansdale, PA area. For the last 13 years, Dr. Allen Conrad has been helping CTS patients with their condition. Your careplan will include Chiropractic, Musculoskeletal Rehabilitation, and Therapeutic Exercises, Dr. Allen serves as the Team Chiropractor for the Blackthorn Rugby Club, in addition to being a Certified Strength and Conditioning Specialist. Montgomery County Chiropractic Center helps people with spinal decompression therapy, massage therapy, and chiropractic care for different kinds of injuries. What makes Dr. Conrad different from the rest is his complete dedication towards understanding the pain of the patients and giving his 100% in helping them manage their CTS pain. He along with his proficient staff members to puts together a 3-phase rehab program to decrease pain, improve flexibility, and increase core stabilization through therapeutic exercise. 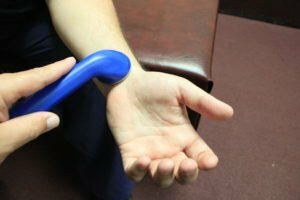 If you suffer from wrist pain, and live in the Lansdale Pa area, pay a visit to Montgomery County Chiropractic Center right away!